Kubu Surf School has been introducing beginner surfers to the sport of surfing since 2007. Through this experience, they have refined their learn to surf programme to offer the best beginner surf lessons. Their multi-day beginner progressive surfing lessons are for everyone. They teach paddling, standing up, dropping into waves and riding across them. You can expect to stand up and ride your first wave on the first day. The longer you stay, the more you learn with the intention of teaching all the skills necessary to surf forever! You will be staying at Rumah Canaria Bungalows. This traditional bamboo bungalows are located in the most peaceful place on the island to feel the beautiful atmosphere around the coconut tree field and white sand, the bird sounds, and Indonesian culture with a comfortable and classic bamboo room, that you can have an amazing shower under the coconuts tree and starts with an outdoor toilet. Friday and Saturday, Kubu Surf School has live music next door with the best Reggae band in southeast Asia. Rumah Canaria Bungalows have two units bungalows with a garden, and a place to chill, only five minutes walking to the beach. There is also a kitchen equipped with fridge and stove that you can use to cook your own food. Learn to surf waves not just stand up! See yourself surf on the videos! Learn how to surf fast! Catch unbroken waves & take the drop! The safest & easiest waves to learn in Indonesia. On the last day, pictures are taken to see and check on your progression. Kubu Surf School will bring you to the Exile, the best bar on the island to see the sunset. Every afternoon, guests can play guitar and sing, and play football by the beach. Sometimes, guests enjoy some fish or chicken barbecue, or simply by cooking together. There will be also one snorkeling session provided in a turtle point, including the accessories (no fins) such as mask and tubes. Dex Siner has been a surfer since he was seven years old. He is a local surfer and tour guide in Indonesia. He will show you best spots to surf and the most beautiful places in Lombok and Sumbawa. Herman loves surfing since he was a child and today teaches and spread his passion for the sport. Jacka will be your surfing instructor. He believes that being happy and smiling is the most important attitude required to learn surfing. This camp takes place in the Island of Gili Trawangan around coconut tree field, on the Northwest Lombok, Indonesia. You can be sure you are going to forget the stress of modern life. The bungalows are located in a Reggae community on the island. And the beach is not far, only two minutes by bike (Kubu Surf School provides it for free). The island is one of the best spots to surf, diving, snorkel with turtles, beautiful sunsets. Also in the night life, there are a lot of pubs and musicians in the central area. In this surf camp, you will be provided with delicious breakfast every day. Coffee, tea, welcome seasonal fruit juice and mineral water are also complimentary. The big menu in the next cafe bar for lunch and dinner is also available. Also, you can drink cocktails and beers and it is open 24 hours a day. During this surf camp, you can also do activities like diving, snorkel, paddle board, yoga, play music, see beautiful sunsets, go to traditional night market, and party. You can also try a traditional Balinese massage. If Balinese massage is not your thing, you can always choose different kind of therapy you want such as full body massage, sasak massage, foot reflexology, body exfoliation, or Indian head massage. From Bali, Padang Bai harbor, you can take a Fast boat to Gili Trawangan. From Lombok, you can take a public boat from Bangsal harbor to Gili Trawangan. You can walk from Gili harbor to North Island around ten minutes, or take a horse car. Ask for the Black & White cottages, Kubu Surf School is on next street. Airport: Lombok International Airport Airport transfer available: Lombok International Airport (US$25 per person) Additional charges may apply. You can request this in the next step. 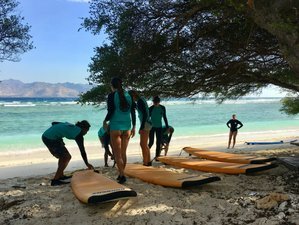 Located in Senggigi, West Lombok, Indonesia, Kubu Surf School offers surf and yoga classes to improve your physical strength and yoga postures. This surf camp is available all year round. Please select an arrival date below.